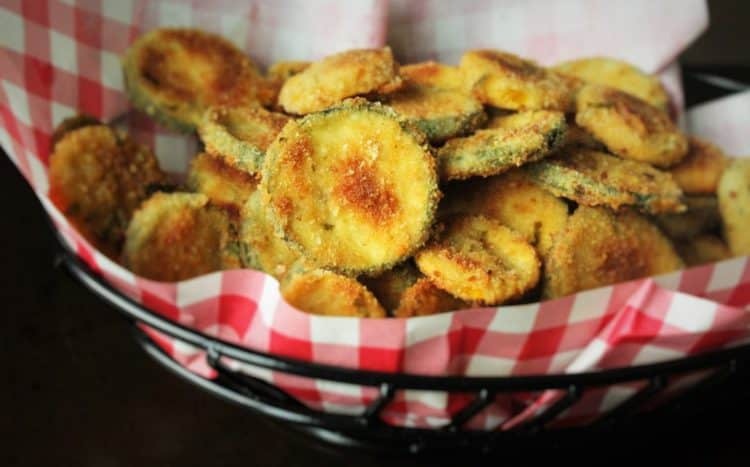 These zucchini crisps have an interesting story behind them. 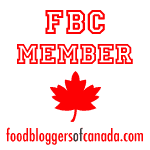 I’ve often written about the fact that my children were picky eaters when they were younger. Thank goodness that’s changed, but nonetheless their fussiness inspired me to become creative in the kitchen. Throughout the years I’ve developed interesting techniques to sneak in extra veggies here and there. It has now become a habit for me to grate extra vegetables such as carrots and zucchini whenever I make anything with ground meat such as meat loaf, chili, Bolognese sauce, shepherd’s pie, and (sometimes) even hamburgers. The possibilities are endless! 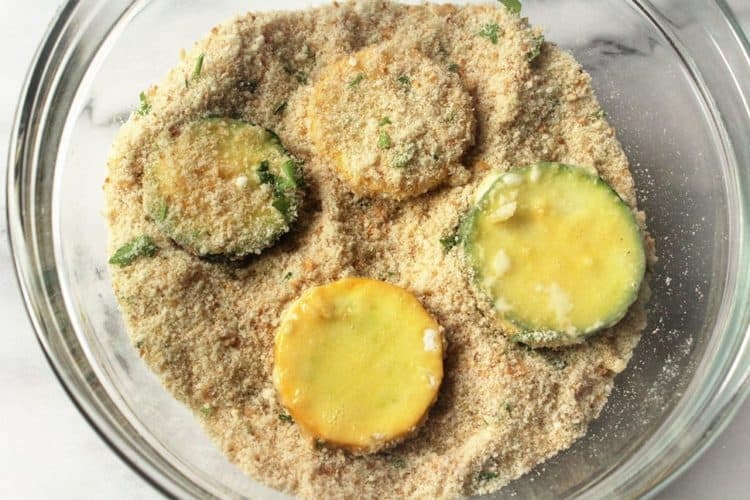 Zucchini is such a mild flavored vegetable so it’s easy to mask. Especially when covered in a delicious crispy parmesan and bread crumb mixture. 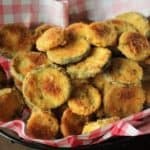 My mother began making these zucchini crisps several years ago and I knew that if I had told my children they were zucchini they would not have tasted one. When they first saw them and asked what they were, I responded with “crispy things”. Yes I know, not creative at all but I had to think fast. Besides, it didn’t matter because they didn’t ask any questions and began to dig in. 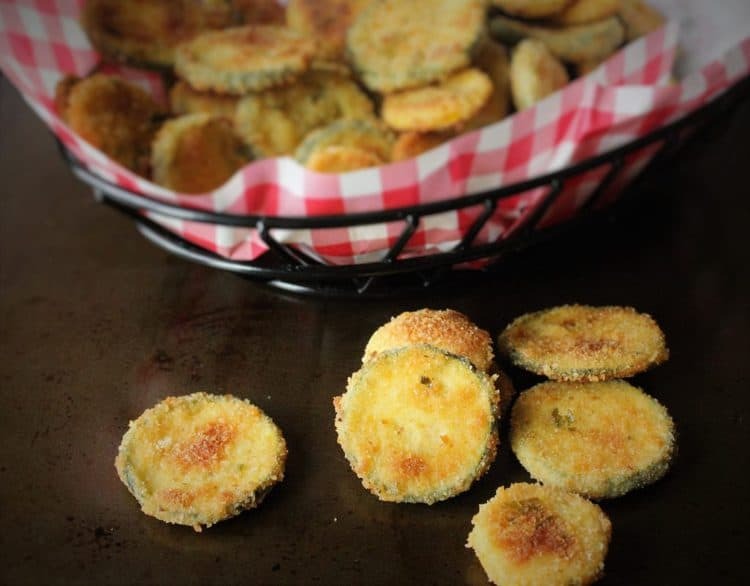 Of course they loved them and my mother has been serving these “crispy things” ever since, especially during the summer when she has an abundance of zucchini in her garden. I have to tell you that no matter how many you make, you will always immediately run out. You will find yourself picking up the extra bits of breadcrumbs at the bottom of the plate and licking your fingers. Just like having an open bag of chips lying around, one is never enough. Especially if you’re fond of salty, crunchy foods such as I am. They take a few minutes to prepare and hopefully you don’t mind have eggy, breaded fingertips. 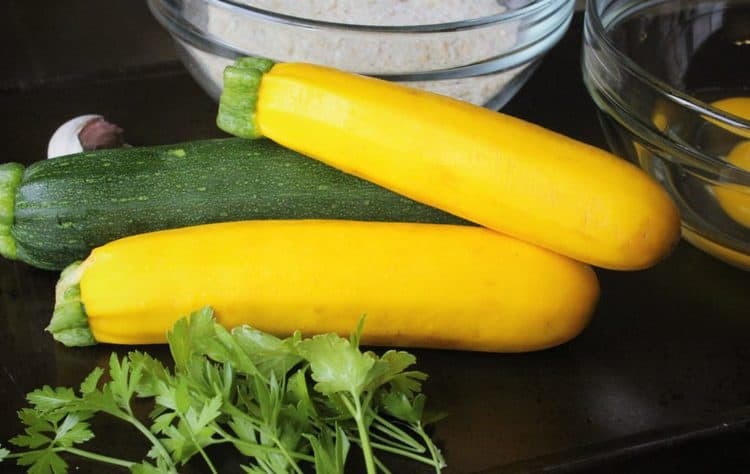 My mother has always makes them with green zucchini but I decided to use a couple of yellow squash that were available at the market this week and they’re just as yummy. I’ll leave you with this, fried calamari rings were onion rings until a few years ago! 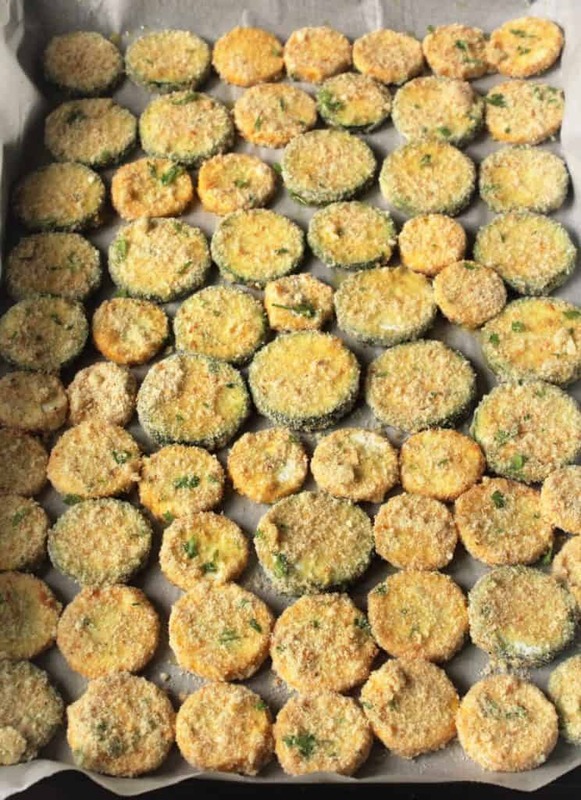 These Baked Parmesan Zucchini Crisps are a family favourite and a great way to get the little ones to eat they're veggies! Preheat oven to 375F. Prepare a baking sheet by covering with a sheet of parchment paper and grease with olive oil. Prepare 3 bowls for dredging the zucchini. Place flour in a bowl, beaten eggs in another bowl and in a 3rd bowl mix together the breading ingredients (breadcrumbs through garlic). 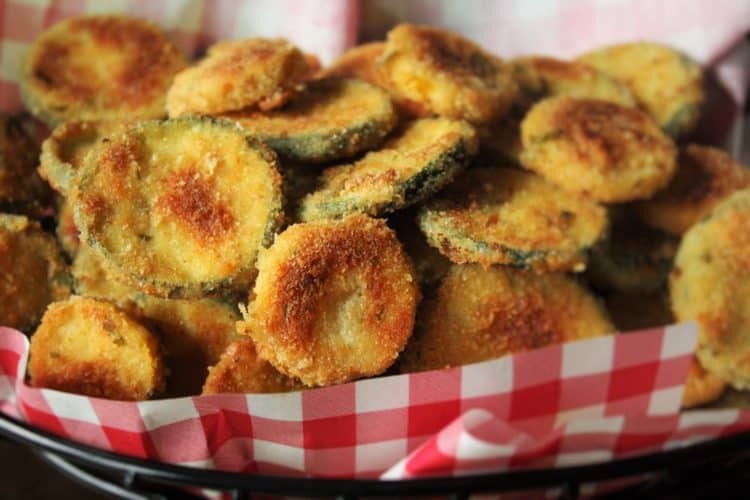 Begin dredging the zucchini in the flour, shaking off the excess, next dip into the beaten eggs. Last, cover both sides in the breadcrumb mixture. Place on the baking sheet. 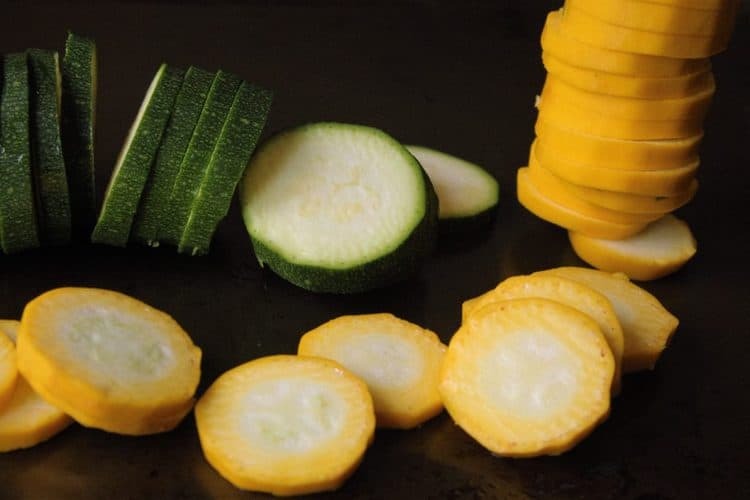 Continue with remaining zucchini. Drizzle about 1 tablespoon olive oil over the zucchini. Bake for 20-30 minutes until golden brown and crispy.